Objective: Resection of large Vestibular Schwannomas (VSs) can be associated with postoperative facial nerve injury. Diffusion-based tractography has emerged as a powerful tool for three-dimensional imaging and reconstruction of white matter fibers; however, tractography of the cranial nerves has not been well studied. In this prospective study, we aim to predict the position of facial nerve in large VSs (>3 cm) using Diffusion Tensor Imaging (DTI) tractography and correlate it with the intraoperative finding of the position of facial nerve. Materials and Methods: Twenty patients with a large VS (>3 cm) undergoing surgery were subjected to preoperative DTI to predict the position of the facial nerve in relation to the tumor. The surgeon was blinded to the results of the preoperative DTI tractography. A comparative analysis was then made during operation. The location of the facial nerve in relation to the tumor was recorded during surgery using facial nerve stimulator. Results: Of the 20 patients who underwent DTI tractography, it was not possible to preoperatively identify facial nerve in one patient. In another patient, although DTI tractography predicted the position of facial nerve, it was not identified intraoperatively. In the remaining 18 patients, DTI tractography accurately predicted the facial nerve position. The predicted position was in synchronization with the intraoperative facial nerve position in 16 patients (89% concordance). It was discordant in two patients (11%), but this was not found to be statistically significant (P = −0.3679). Conclusion: This study validates the reliability of facial nerve DTI-based fiber tracking for prediction of the facial nerve position in patients with large VSs. The reliable preoperative visualization of facial nerve location in relation to the VS will allow surgeons to plan tumor removal accordingly and may increase the safety of surgery. With this background in mind, we aimed to predict the position of facial nerve in large VSs using high-definition DTI tractography and to correlate it with the intraoperative position of the facial nerve. The reliable preoperative visualization of facial nerve location in relation to VS would allow surgeons to plan tumor removal accordingly and may increase the safety of surgery. In this prospective study, the investigators attempt to validate the reliability of facial nerve DTI-based fiber tracking in patients with large VSs. The investigators hope to utilize this knowledge for better preservation of the facial nerve function in VS surgery. After obtaining the Institute Ethics Committee approval, 20 consecutive patients of either gender with a large VS (>3 cm) undergoing surgery were subjected to preoperative DTI tractography to predict the position of the facial nerve in relation to the tumor (after obtaining a written informed consent from the patient and/or his relative). The study was conducted from December 2013 to December 2014. We have excluded patients in whom there was computed tomographic evidence of calcification or hemorrhage as these parameters are known to interfere with DTI tractography. MRI was performed on a 3-Tesla magnetic resonance (MR) scanner (Achieva; Philips Medical Systems, Netherlands) by using a 32-channel head coil. A high-resolution anatomic imaging was performed using a volumetric T1-weighted three-dimensional (3D) gradient echo sequence (repetition time [TR]/echo time [TE]/inversion time, 1640/2.28/552; flip angle 12°; number of sections 160; and isovoxel resolution of 1 × 1 × 1 mm 3). DTI was performed using a single-shot echo-planar sequence with the array sensitivity – encoding technique. Motion-probing gradient orientations were applied along 15 directions, and the B-factor was set at 800 s/mm 2. The acquisition parameters used were as follows: TR/TE, 4750–5600 (min)/80–90 (min) ms; section thickness, 1.5 mm without intersection gap, number of slices 40; NEX 3; reconstructed matrix 256 mm × 256 mm and reconstructed voxel size 0.78 × 0.78 × 1.5 mm. Acquired diffusion-sensitized and reference image sets were transferred to an Intel Pentium Windows-based operating system (Microsoft) for further data analysis. Tensor calculation and tractography was performed by DynaSuite Neuro 3.0 software (In Vivo Corp.; Gainesville, USA). All diffusion-weighted and nondiffusion-weighted images were first realigned by affine transformation using the automated image registration program, to further minimize potential small bulk motions that may have occurred during the scans. The elements of the diffusion tensor were calculated for each pixel using multivariate linear fitting. After diagonalization, three eigenvalues and three eigenvectors were obtained. The eigenvector associated with the largest eigenvalue was used as an indicator of fiber orientation. Tractography was performed on the basis of fiber assignment by continuous tracking. The fiber propagation was stopped at a fractional anisotropy threshold of <0.12 or an angle threshold >60°. The DynaSuite Neuro 3.0 software (In Vivo Corp.; Gainesville, USA) permits isolation of tracts passing through a single region of interest (using the inclusive “OR” operator) or multiple regions of interest (using the exclusive “AND” operator). The facial nerve was isolated by drawing an “OR” region of interest around the internal auditory meatus and an “AND” region of interest around facial nerve entry area at the brainstem in the contrast-enhanced three dimensional (3D) T1 sagittal sections. Unrelated fibers, such as fibers crossing the midline and those ascending or descending in the brainstem cerebellum, etc., were removed using a “NOT” region of interest. To be included in the study and for further analysis, the facial nerve had to be continuous from the brainstem to the internal auditory meatus. If it was not continuous, it would be considered as unidentifiable and it was concluded that DTI had failed to isolate that particular facial nerve. All the patients underwent surgical excision of the VS using the retromastoid route. The operating surgeon was blinded to the results of DTI tractography. A comparative analysis was then made during operation. The location of the facial nerve in relation to the tumor was recorded during surgery using facial nerve stimulator which records electromyographic responses of facial nerve innervated muscles. Nerve location was categorized using the classification of Sampath et al., as being anterior, posterior, superior, or inferior to the tumor. Anterior and posterior locations were further subclassified into three subcategories such as upper, middle, and lower thirds for further characterization and comparison. There were 20 patients in this study initially. Of the 20 patients who underwent DTI tractography, it was not possible to preoperatively identify facial nerve in one patient. In one patient, although DTI tractography predicted the position of facial nerve, it was not identified intraoperatively. These two patients were excluded from the final analysis. Of the 18 patients who were included for analysis, there were 9 females and 9 males with a male:female ratio of 1:1. The mean age of the study population was 39 years (range 17–60 years). All the patients had tumor size more than 3 cm (range 3–6.1 cm). One patient had neurofibromatosis-II and had bilateral schwannomas, but the left-sided lesion was resected surgically. 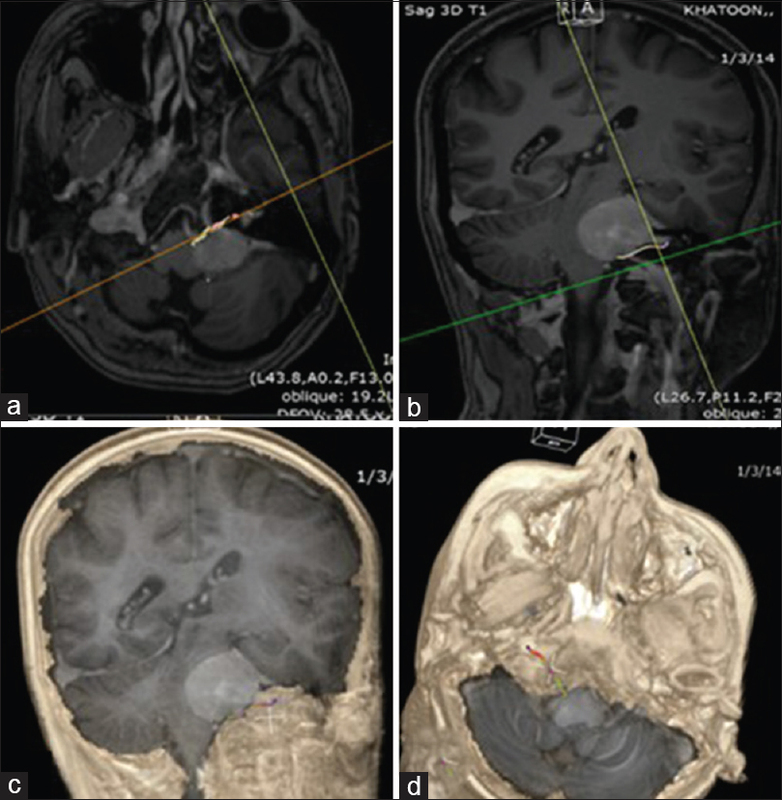 Preoperative T1-weighted, T2-weighted, and T1 contrast MRI were carried out to know the size of the tumor, associated brainstem compression and hydrocephalus. DTI sequences (using 32-channel head coil, no intersection gap) were acquired with a 3-T MRI scanner. Seven patients underwent a preoperative cerebrospinal fluid diversion in the form of ventriculoperitoneal shunt due to the presence of hydrocephalus. Thirteen patients had a predominantly solid tumor on MRI, 5 patients had a predominantly cystic tumor, and 2 patients had solid-cystic tumors. All the patients were operated by the retromastoid approach in park-bench position using standard surgical principles and techniques. Facial nerve monitoring and nerve stimulation was used in all the cases for its intraoperative identification. Of the 20 patients who underwent DTI tractography, it was not possible to preoperatively identify facial nerve in one patient and therefore, he was excluded from the study. In another patient, although DTI tractography predicted the position of the facial nerve, it was not identified intraoperatively. Of the remaining 18 patients, DTI tractography predicted that facial nerve position was in synchronization with the intraoperative facial nerve position in 16 patients (89% concordance). It was discordant in two patients (11%), but this was not found to be statistically significant (P=0.3679) using McNemar's statistical test. In one patient with a discordant result, DTI predicted the position of facial nerve in anterior middle third location, whereas intraoperatively, it was found in the anterior upper third region in relation to the tumor. In another case, DTI predicted the position of the nerve to be superior to the tumor whereas during surgery, it was found to be in the anterior upper third region in relationship to the tumor. Overall, the most common site of facial nerve in our series was the anterior upper third region as seen in 8 of 18 patients followed by the anterior middle third region in 7 patients [Table 1] and [Figure 1],[Figure 2],[Figure 3]. Facial nerve preservation is a very important aspect of VS surgery. Nerve preservation rates are inversely proportional to the size of schwannoma.,, Facial nerve paresis is a devastating complication and has an adverse psychosocial impact, which leads to a poor quality of life., Patient may require additional facial reanimation procedures due to facial nerve palsy. Preservation rates depend on the surgeon's experience, size of the tumor, the preoperative status of the facial nerve function, and the nerve morphology. Large tumors compress, displace, and distort neurovascular structures and it becomes extremely difficult to predict the course of the facial nerve., Knowing the location of facial nerve before surgery will help in reducing the chances of inadvertent facial nerve injury. More recent MRI modalities, such as diffusion-weighted imaging and DTI, have allowed a 3D mapping of the cranial nerves in healthy individuals.,,[10[,, Since identification and preservation of facial nerve in large tumors (>3 cm) is a surgical challenge, we specifically included this subset of tumors in our study. Literature is available regarding the application of DTI in the prediction of facial nerve position in VSs [Table 2]. Hodaie et al., first studied the radiological course of cranial nerves in four healthy individuals using DTI. Taoka et al., demonstrated a concordance between the preoperative DTI reconstruction and the intraoperative location of the facial nerve in 5 patients (62.5%). Roundy et al., in their study of five cases of VS, could correctly identify facial nerve preoperatively in all cases using high definition (HD)-DTI. Another study conducted by Choi et al., also found complete correlation between the preoperative DTI imaging predicted facial nerve position and the intraoperative findings. Chen et al., successfully combined tractography and anatomical imaging to demonstrate the location of the trigeminal and facial nerves in three patients with VS and found that the facial nerve position was primarily anterior and inferior. Gerganov et al., in a study of 22 patients with a large VS, concluded that the position of the facial nerve in relation to the tumor could be predicted reliably in 91% patients using DTI-based fiber tracking. Zhang et al., reported 100% correlation between the preoperative facial nerve DTI and its intraoperative location in a series of seven patients. Yoshino et al., further used DTI for the preoperative visualization of both facial and cochlear nerves in 9 of their 11 patients. The current study demonstrated a concordance rate of 89% between the preoperative DTI tractography and the intraoperative position of facial nerve during VS surgery, which is comparable to the previously published reports.,,,, The reliable preoperative visualization of the facial nerve location in relation to VS would allow surgeons to plan tumor removal accordingly and may increase the safety of surgery. This would be helpful in the better preservation of facial nerve function during VS surgery. This study validates the reliability of facial nerve DTI-based fiber tracking for prediction of the facial nerve position in patients with a large VS. The reliable preoperative visualization of the facial nerve location in relation to the VS allows surgeons to plan tumor removal and may increase the safety of surgery. We acknowledge the efforts of Mrs. M. Kalaiwani, Statistician in the Department of Biostatistics, All India Institute of Medical Sciences, New Delhi, for the statistical analysis. This study was funded by an intramural research grant of the All India Institute of Medical Sciences, New Delhi, India. Samii M, Gerganov VM, Samii A. Functional outcome after complete surgical removal of giant vestibular schwannomas. J Neurosurg 2010;112:860-7. Samii M, Gerganov V, Samii A. Improved preservation of hearing and facial nerve function in vestibular schwannoma surgery via the retrosigmoid approach in a series of 200 patients. J Neurosurg 2006;105:527-35. Zhang Y, Chen Y, Zou Y, Zhang W, Zhang R, Liu X, et al. Facial nerve preservation with preoperative identification and intraoperative monitoring in large vestibular schwannoma surgery. Acta Neurochir (Wien) 2013;155:1857-62. Youssef AS, Downes AE. Intraoperative neurophysiological monitoring in vestibular schwannoma surgery: Advances and clinical implications. Neurosurg Focus 2009;27:E9. 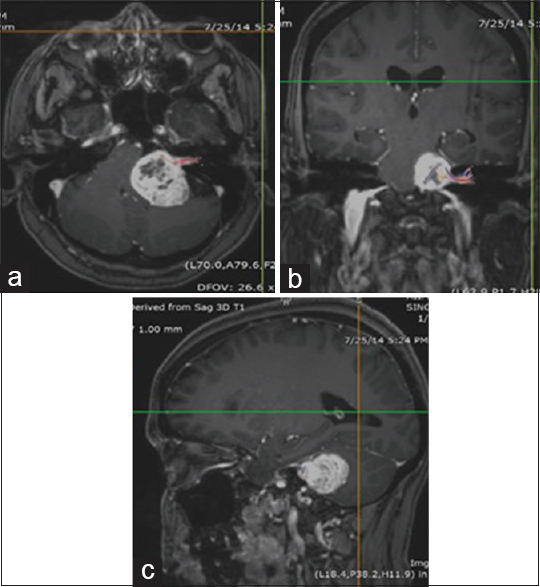 Nakamura M, Roser F, Dormiani M, Matthies C, Vorkapic P, Samii M. Facial and cochlear nerve function after surgery of cerebellopontine angle meningiomas. Neurosurgery 2005;57:77-90. Gerganov VM, Giordano M, Samii M, Samii A. Diffusion tensor imaging-based fiber tracking for prediction of the position of the facial nerve in relation to large vestibular schwannomas. J Neurosurg 2011;115:1087-93. Sartoretti-Schefer S, Kollias S, Valavanis A. Spatial relationship between vestibular schwannoma and facial nerve on three-dimensional T2-weighted fast spin-echo MR images. AJNR Am J Neuroradiol 2000;21:810-6. Yoshino M, Kin T, Ito A, Saito T, Nakagawa D, Ino K, et al. Combined use of diffusion tensor tractography and multifused contrast-enhanced FIESTA for predicting facial and cochlear nerve positions in relation to vestibular schwannoma. J Neurosurg 2015;123:1480-8. Choi KS, Kim MS, Kwon HG, Jang SH, Kim OL. Preoperative identification of facial nerve in vestibular schwannomas surgery using diffusion tensor tractography. J Korean Neurosurg Soc 2014;56:11-5. Wedeen VJ, Wang RP, Schmahmann JD, Benner T, Tseng WY, Dai G, et al. Diffusion spectrum magnetic resonance imaging (DSI) tractography of crossing fibers. Neuroimage 2008;41:1267-77. Sampath P, Rini D, Long DM. Microanatomical variations in the cerebellopontine angle associated with vestibular schwannomas (acoustic neuromas): A retrospective study of 1006 consecutive cases. J Neurosurg 2000;92:70-8. Samii M, Tatagiba M, Matthies C. Vestibular schwannomas: Surgical approach. J Neurosurg 2001;94:144-6. Samii M, Matthies C. Management of 1000 vestibular schwannomas (acoustic neuromas): Hearing function in 1000 tumor resections. Neurosurgery 1997;40:248-60. Gerganov VM, Samii M. Giant vestibular schwannomas. World Neurosurg 2012;77:627-8. Chen DQ, Quan J, Guha A, Tymianski M, Mikulis D, Hodaie M. Three-dimensional in vivo modeling of vestibular schwannomas and surrounding cranial nerves with diffusion imaging tractography. Neurosurgery 2011;68:1077-83. Yoshino M, Kin T, Ito A, Saito T, Nakagawa D, Ino K, et al. 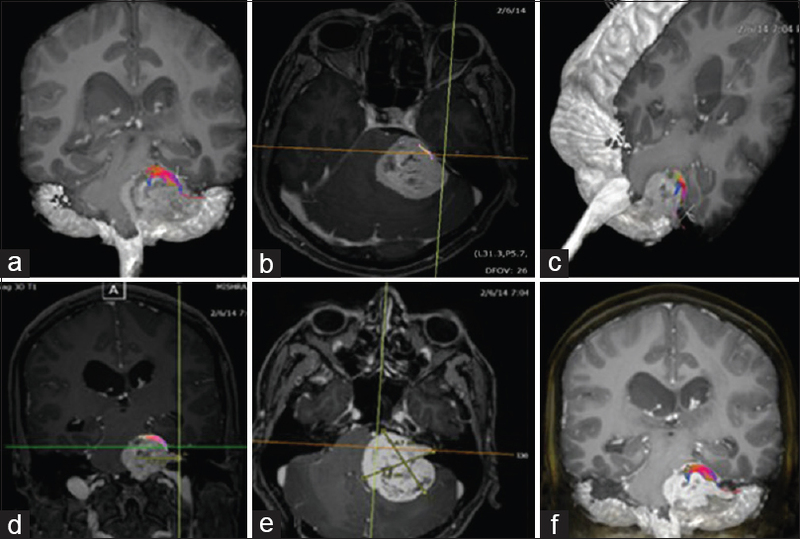 Feasibility of diffusion tensor tractography for preoperative prediction of the location of the facial and vestibulocochlear nerves in relation to vestibular schwannoma. Acta Neurochir (Wien) 2015;157:939-46. Hodaie M, Quan J, Chen DQ.In vivo visualization of cranial nerve pathways in humans using diffusion-based tractography. Neurosurgery 2010;66:788-95. Taoka T, Hirabayashi H, Nakagawa H, Sakamoto M, Myochin K, Hirohashi S, et al. Displacement of the facial nerve course by vestibular schwannoma: Preoperative visualization using diffusion tensor tractography. J Magn Reson Imaging 2006;24:1005-10.